Best Indoor Trampoline - Trampoline for Me! I had a big trampoline in the backyard and I was really satisfied with it. I mean, it was awesome. But then comes the winter. It’s cold, snowy, rainy… And you simply won’t go out and make yourself even colder. No, you prefer to stay in the house. Then you start thinking about how summer is way better – you can spend time outside, have fun with people, make barbecue, backyard parties and so on. But, why would you need to wait for summer to do things for summer? 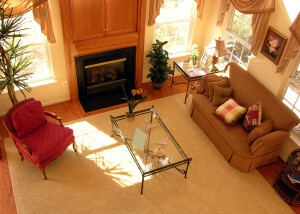 You can simulate summer in your own living room! Just put some things you usually do in your backyard and voila! You have your personal summer. Add a trampoline? Why not! Just make sure it’s not that big and it’s indoor compatible. 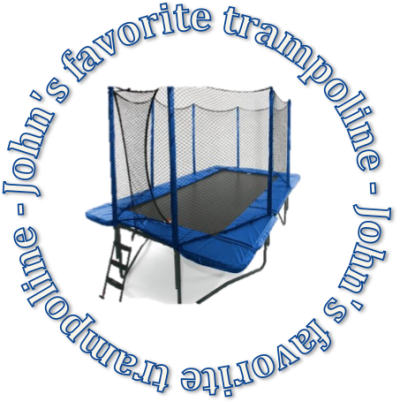 So you’re looking for the best indoor trampoline? Just keep reading. Reviews are below, and all of the recommendations are from personal experience. It was really fun looking through all these indoor trampolines. There are two types – foldable and unfoldable. As a rule of thumb, foldable are usually for kids, so you can find them in that section. Bear in mind that they are made with safety in mind so you can’t really jump high on them. The alternative is unfoldable, meaning you have to disassemble them if you want to pack them. 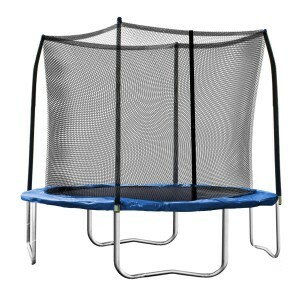 These are actually the regular trampolines, but let’s just say that they are small, meaning they can fit indoors. I’ll give you two recommendations, one is 8ft and one is 10ft. Enjoy. Skywalker trampolines usually are gold – they offer the best value for the money, they fit into the budget and they have some pretty important basic safety measures. This one comes with a safety enclosure and safety pad. The net connects directly to the mat, which is Skywalker exclusive, so nobody will be able to pinch themselves on springs. It supports up to 175 pounds of bouncers, so it should be enough for two kids as long as they fit into that weight limit. Of course, the weight limit is there for your safety. This one isn’t really high so you won’t need a ladder for it. It isn’t foldable, which means it is meant to be assembled and left like that. Now, the assembly isn’t really that hard, a friend of mine did it all by herself while she was pregnant, although it wouldn’t hurt if you have somebody to help you. It isn’t a two-man job as bigger trampolines are, but it still helps. Do you wish to take it indoors? Your wish can be granted. If you can fit it, of course. The only thing I’d suggest is that you wrap some paddings (pick your best) around the legs in order to not damage the floor. Don’t say I didn’t warn you! All in all, a decent trampoline, not for a really high bounce, indoors friendly, unfoldable, budget-friendly. I loved this one while we had it! Click here to view Skywalker 8ft round trampoline on Amazon! First of all, weight limit is the same as the last one. On the box, it says that it is a 175 pounds max and although I tend to take these precautions very seriously, I managed to find out that it can hold about 200 pounds. I wouldn’t go above it. It is a really solid and stable thing, rust-resistant frame and 64 rust-resistant springs and everything you need to make a trampoline work – classical Skywalker thing. The safety net is attached directly to the jumping mat via the buttonhole patent, so that makes it even safer. Also, it isn’t really tall, so you won’t be needing any ladders for this one as well. Instructions for the assembly are a little unclear and a bit confusing, so I suggest reading all of them first before starting the assembly process. Also, I recommend taking two persons for this job because at some points you will need an extra hand. 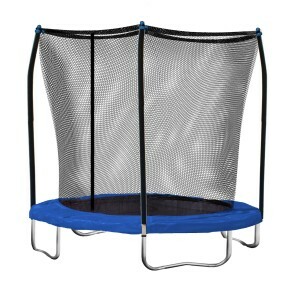 It is exactly 10ft in diameter, which makes around 8.5ft of jumping mat space and the rest are springs and the frame. This is obviously important when you’re dealing with a small space. As with the last one, when you decide to bring it inside, be sure to wrap some paddings around the legs of the trampoline – the shock from jumping can really damage your floor and you probably don’t want that, right? Oh, and bear in mind that you can jump a little higher with this, so try not to jump too high while you’re inside. I’m telling this because we don’t use safety net when we use our trampolines inside – and that can simply put, break some stuff around. The great trampoline, as the last one, just a little bigger. It’s also a little bigger in terms of price. Make your best pick! Click here to view Skywalker 10ft on Amazon!